That's the individualist's perspective of success. Humanity has only evolved because humans tell what they know, eventually, somehow. Imagine, just imagine, if this was an organized process to do tell everything we know to the most people we can, as quickly as possible. Instead we get schools that restrict what we should know and half of it is garbage. A fungus, as a single organism, that can extent for kilometers, can transmit "information" from end to end (cell to cell), in a non-hierarchical manner, at the speed of electricity. And the same organism can live for thousands of years. The wisdom of fungi! Indeed. Lucky the bar isn't too high, though. Why do you never see a Hippopotamus hiding in a tree? Because they're so good at it! How many psychoanalysts does it take to change a lightbulb? None, the lightbulb needs to want to change itself. Two thirsty chemists walk into a bar. One chemist says to the bartender, "I'll have a glass of H2O". He drinks it down and is very satisfied. After seeing how happy the first chemist is, the other chemist says, "WOW! I'll have a glass of H2O too!" He drinks it down and is sent to the Emergency Room. Took a moment to catch the joke, the bartender gave him what he asked for! When contemplating this or that, always be aware that this may not correlate to that; therefore, that isn't necessarily this in the grand scheme of things...and at the end of the day, this and that don't matter, because in the realm of this, that is always speculative when compared to this. ...and you can quote me on this...or that. If no one knew how a blonde navigate on the internet the answer is really simple she pours water on the keyboard ! Not too dry but a little sexist. ask us about our tuna! he asks the guy behind the counter, "what about the tuna?" the guy behind the counter says: "oh yeah-- its poison." the customer says "if the tunas poison, why do you have a sign that says 'ask us about our tuna?'" the guy behind the counter says: "sometimes i forget!" 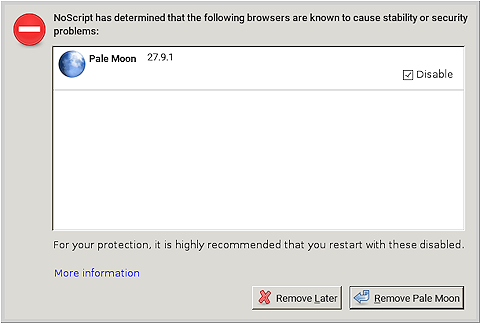 - The salesman says, I make the most secure browser, it is called palemoon, but you shouldn't run noscript on it as it causing instability with the browser and breaks some pages. - But if I can't run the industry's leading script blocker on it why do you call it secure? Ok, I know, it is not very funny, it is actually not funny at all! I fail to see the joke. I have two other computers in the house and they are both still running NoScript in Pale Moon. All it takes is to untick the box. in that event, explaining the joke usually ruins the joke. i actually dont think it does for this one, but i do think the debate would ruin the joke thread and im happy to discuss it somewhere else. i will say that if someone posts to a pale moon-related thread this week, i will find it, so theres no need to stray further from jokes on this thread. id be perfectly happy if this thread remained amusing. If my wife ever leaves me, I'm going with her. So I was walking down the sidewalk one day, and this guy comes up to me all distressed and saying (over-and-over)..."I'm a wigwam; I'm a tipi! I'm a wigwam; I'm a tipi! I'm a wigwam; I'm a tipi!" After he had said it several times, I said, "Good grief man! Settle down! You're two tents!"